At present the National Museum houses almost 14 million items from the areas of natural history, history, arts, music and librarianship, located in tens of buildings. 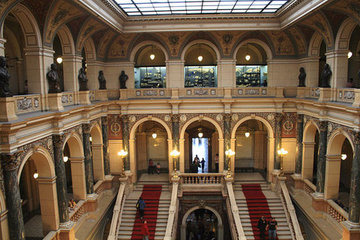 The Národní muzeum (National Museum) in Prague was founded in 1818. Early on, the focus of the museum was centred on natural sciences. It did not become interested in the acquisition of historical objects until the 1830s and 40s, when Romanticism became prevalent, and the institution of the museum was increasingly seen as a centre for Czech nationalism. Serving as historian and secretary of the National Museum in 1841, Frantisek Palacky tried to balance natural science and history. It was a difficult task, however, and it was not until nearly a century later that the National Museum’s historical treasures equalled its collection of natural science artefacts. The real importance of the museum was that it signalled, and indeed helped bring about, an intellectual shift in Prague. The Bohemian nobility had, until this time, been dominant, both politically and fiscally in scholarly and scientific groups. However, the National Museum was created to serve all citizens, lifting the stranglehold the nobility had had on knowledge. This was further accelerated by the Palacky, who in 1827 suggested that the museum publish separate journals in German and Czech. Previously, the vast majority of scholarly journals were written in German. At present the National Museum houses almost 14 million items from the areas of natural history, history, arts, music and librarianship, located in several buildings. The main buliding is currently closed for reconstruction, but there's a new building that is open to the public.